I'm Not Skinny: Mia Mariu Twitter Party WEDNESDAY, JANUARY 22nd! 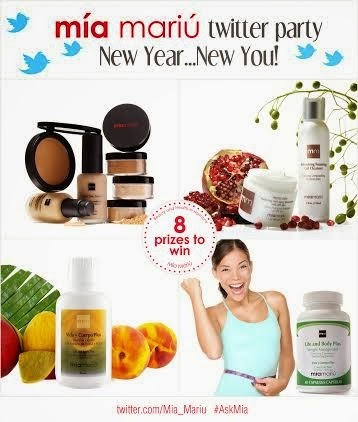 Mia Mariu Twitter Party WEDNESDAY, JANUARY 22nd! I'm a sucker for a twitter party! I love the high paced interaction and a blogger friend shared this event with me...and in turn I'm sharing with you. Mia mariu has their New Year....New You! twitter party Wednesday, January 22nd from 11:30am to 12:30pm CST. If you're an East Coaster like me that's going to be at 12:30 - 1:30pm. Get yourself a head start and follow @Mia_Mariu on twitter and use the hashtag #askmia to participate. Twitter parties have been a big subject of conversation lately. I love them. I typically do twitter parties by having several windows open with the pages I want to follow. For example tomorrow I'll have @Mia_mariu twitter page open in one tab, in another I'll have the search for #askmia open and finally I'll have my interactions open in a third tab. That way I can follow all of the action and respond. It's also important to let your followers know that you're about to participate in a twitter party and that you'll be tweeting a lot. Don't just interact with the brand be sure to engage with other tweeple. It's not necessary to take @mia_mariu in each post, save time and just use the#askmia tag. Help other tweeple by retweeting questions and answers from the @mia_mariu brand. Get ready to ask lots of health product questions, meet new friends on twitter and learn a lot of new things! That's what Twitter parties are best for.